In 2006, the Federal Emergency Management Agency (FEMA) released preliminary flood insurance rate maps that would replace the existing maps that had regulated development at Fort Myers Beach (FL). The new maps would have precluded sidewalk-level commercial uses in much of the town’s pedestrian core. Spikowski Planning, the town’s general planning consultant, commissioned Tomasello Consulting Engineers to peer-review FEMA’s models. Once all errors were corrected, the revised maps were far less damaging to downtown. The new maps with revised elevations have been adopted for Fort Myers Beach, setting the lowest floor level for all new and substantially improved buildings. The new maps prepared by FEMA were adopted by the town through Ordinance 08-09 on August 18, 2008. The newspaper advertisement provides some details; an early draft of proposed Ordinance 08-09 can be downloaded by clicking here. In early August of 2006, the Federal Emergency Management Agency (FEMA) released preliminary flood insurance rate maps (FIRMs) that it proposes to substitute for the existing maps that now regulate development at Fort Myers Beach. FEMA held a public meeting on these proposals at Town Hall on October 26, 2006; further information is available from Lee County. The first, titled "Summary Report," identified data gaps or mapping alternatives that were overlooked by FEMA or its contractors, and examined additional engineering or modeling tasks that might supplement the work that had been completed to date. The second, titled "Summary Report 2," evaluated the Draft Preliminary Flood Insurance Rate Maps (FIRMs) provided to town officials in the fall of 2005 and identified how and why they differed from the pre-existing maps. 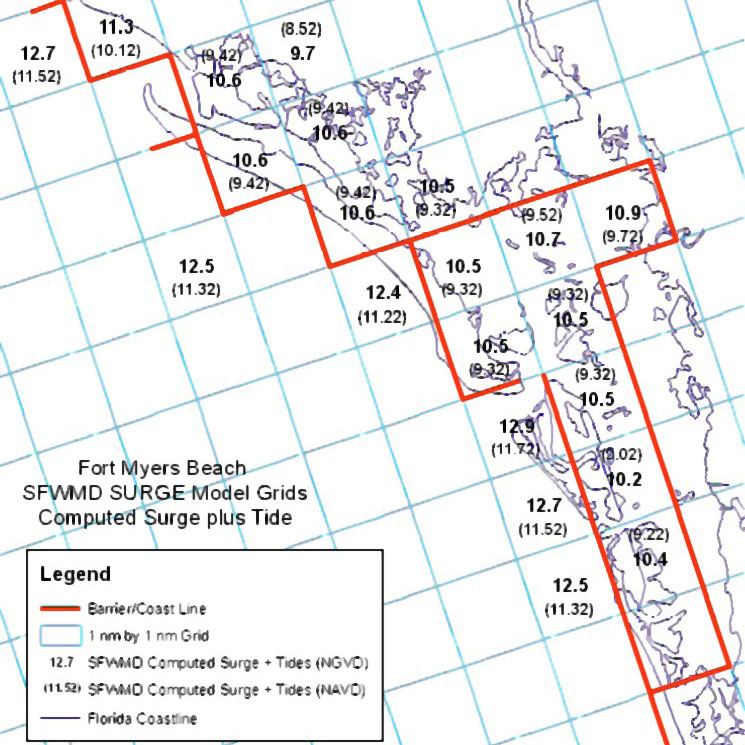 This report recommended that FEMA consider the more thorough analyses contained in these reports and apply them to more locations than FEMA had thus far; the FEMA computer model was applied as infrequently as once every two miles along Fort Myers Beach, requiring interpolation and guesswork to create the detailed regulatory maps between those locations. The more thorough methodology would reduce the negative impacts of the proposed maps on property owners throughout the town.